It has been a busy couple of days here at Casa Dwyer. First, the epic review of the Mandarin Oriental below and now the announcement of Casa Dwyer's first spin-off: The Wellesley Wine Press! I started the Wellesley Wine Press for a few reasons. First, I have a lot of information about wine running around in my head and increasingly it felt unbalanced to include all of that content on Casa Dwyer. Second, I wanted to try my hand at launching a web site and making a tiny bit of money on small ads and product links. I don't have grand visions for making a fortune- my goal is to pay for the $8 domain registration within the first year. How many busineses can you start for less than $10? (or free even if you didn't want to spring for the URL?) I'll let you know how it goes 1 year from today. 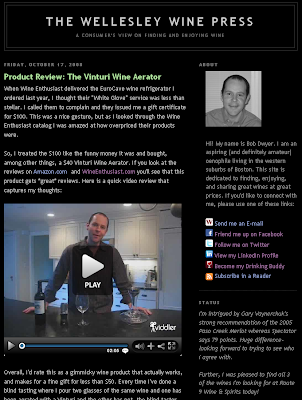 Finally, I'm really excited about creating a site to discuss wine primarily from the consumer's perspective. There's a sea of information on the Internet about wine. Most of it is either wine reviews (professional or amateur), or retailers giving you their take on wine. I really want to bring a value-minded consumer's view to the wine world, triangulating professional reviews, typical wine drinker preferences and sensibilities, and product availability. I'll also throw in some wine shop and wine product reviews. I anticipate having a mild slant towards Massachusetts, but I hope the information is interesting reading for anyone mildly interested in wine or my views on consumerism. It is a little ironic that there be a site dedicated to buying wine in Wellesley since the town doesn't allow wine stores. Although you *can* buy a bottle of wine at a restaurant, no wine can be sold in grocery stores and there are no liquor stores, period. Some nearby towns do allow wine sales and I'll be featuring the stores I have a good experience with for the benefit of others who might be interested. I do hope you enjoy the new content on The Wellesley Wine Press. I'd love to hear what you think.